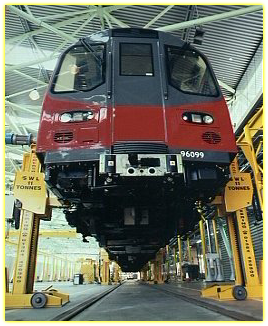 This machine, manufactured by Lloyds British Somers (formerly Somers Railway Engineering) in Halesowen lifts a 3 car underground train (half of a full train). (programmable logic controller) running software designed by Buswell Machine Electronics Ltd. The machine includes a separate microcontroller-based safety circuit that monitors the plc control for malfunction. This is to avoid a single-point failure possibility in the plc. Although inherently very reliable, like all electronic devices plc's can and do fail in unpredictable ways.